‘Kidney tubule cells from hibernators have an increased resistance to oxidative stress compared to non-hibernators. Based on our research into hibernation, we have identified a series of chemical entities which are capable of protecting the mitochondria in non-hibernating species, just like hibernating species do’, says Pieter Vogelaar, chief operational officer and researcher at Groningen-based biotech company Sulfateq B.V. ‘These 6-chromanols might offer great therapeutic benefit in diseases where mitochondrial function is impaired.’ To prevent acute kidney injury during open heart surgery, for instance. 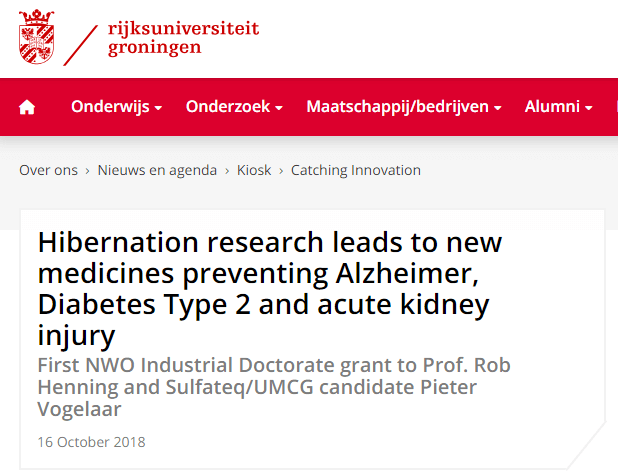 Read the full article on the website of the University of Groningen (RUG).